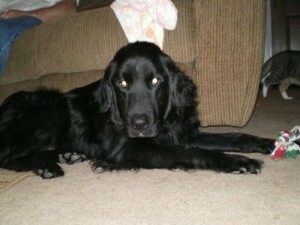 Brady - Save-A-Life, Inc.Save-A-Life, Inc.
Brady is doing great and he is adored by everyone. He’s settled into a routine and is eating well. He follows me around all day while I’m doing stuff around the house and loves to ride in the car to pick up my boys from school. He also waits with me at the bus stop for my daughter. When I do have to leave him to run an errand, he stays in the house and sits by the door until I come back. He loves to come outside and watch the kids ride their bikes and he’s introduced himself to some of our neighbors and their dogs. He also loves to sit on the couch and just hang out with our family. When we go for walks outside he usually brings his squeaky skunk in his mouth. Both of my cats are used to him now and Brady just looks at them in amusement. At night Brady comes with me to tuck all the kids in—then he stays in my daughters’ room until she falls asleep. He ends up sleeping with my husband and me. We’re just so thankful that you saved such a great dog.